It’s a beautiful 30 degree day in sunny Melbourne, and I’m enjoying the light breeze out on my back deck while I tap away on my laptop writing this blog. Work life balance is an important practice at Psylutions, and as part of that we try to have one day a week where we work from home. And no, this does not mean I sleep in until 9am and check emails from my bed (as my partner likes to believe I do! ), but I find I often work longer hours when I work from home than I do when I’m in the office. Work life balance is a broad term that can mean different things to different people. It can be in the form of flexible work hours, part time work, working from home, or simply managing your time at work more effectively so you have enough time left to enjoy the other things in life. 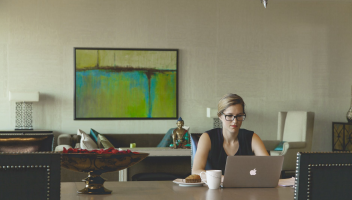 For myself, working from home is key to my work life balance, but you still need to be careful about how you do it to be able to enjoy the psychological and productivity benefits. For one thing, whether technology is a facilitator of work life balance or whether it is an obstruction is still up for debate. There are pros and cons to being able to take your office with you anywhere in the world. Sometimes it’s great to be able to work away from the office and the distractions that sometimes come from such an environment, and I find the change of scenery when I’m working from home can often give me a different perspective, and makes me feel more energised. On the other hand, technology can also make it difficult to be able to switch off. Now that you can check your emails on your phone or be contacted on your work mobile at any time, it’s more challenging than ever to stop thinking about work. Particularly for people that have a home office, trying to separate your work life and your home life is even more problematic when they are one and the same. The importance of developing strategies around ‘leaving your work at work’ is critical to successful work life balance, and unless you make a concerted effort to do it, it’s something that can be difficult to do well. You definitely need to be disciplined about how you stop working once you’re done for the day. Nonetheless, the psychological benefits and flexibility that comes with working from home outweigh the potential negatives. I’d love to hear how you manage your work life balance, please feel free to leave a comment below.